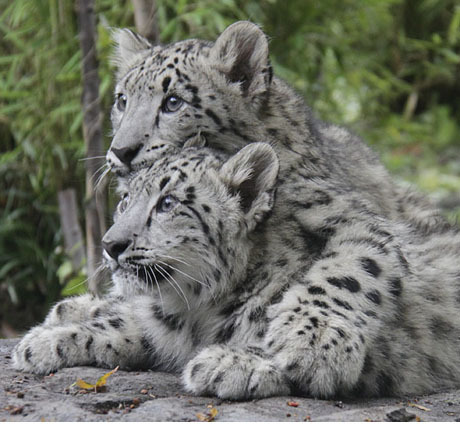 Two adorable snow leopard cubs made their public debut at the Central Park Zoo this week. The twins were born on June 2, 2013 and now weigh about 30 pounds each. When fully grown they can be anywhere from 60 to 120 pounds. Zoe, the mother is seven and was born at the Sacramento Zoo and Askai is six and came to us via the Bronx Zoo but was born in a zoo in Berlin, Germany. The ‘awwwwwwwwwww’ factor was loud and clear from happy visitors who came to see the cubs this week. I encourage you to drop everything and visit us as soon as you can. They grow up quickly. I dedicate this week’s photo montage to Zoe and the yet, un-named cubs. If you scroll to the bottom you can see the very handsome Askai, the cubs’ father. For those of you that are signed up (or want to sign up – there are spaces left) for the two photo workshops at the zoo this month will get to have a few private moments with the cubs before the public runs up the hill to see them. Click here and under Family Programs you will find: Grandparents Photo Series: Breakfast with the Birds next Sunday, November 17 from 8:30 to 10:30 and under Adult Programs you will find: Photo Series: Breakfast with the Birds two weeks from today on November 24th from 8:30 to 10:30. Sign up – it’s fun and you will see these a adorable cubs for sure. They are adorable indeed. Hope their population increases in wild. Judith you did it again. These photos are fantastic. I love the expressions on their beautiful little faces. The action shots are great. Definitely an Awwwwwwwwwwwwww moment. Can’t wait to see them in person. What a bunch of hams! What beautiful critters! Almost as cute as Audrey and Roberta…….They are the new standard for cuteness!! !